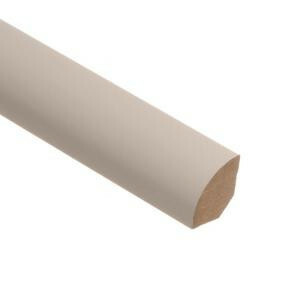 Recoatable White quarter round is used to accent the transitions from baseboard to floor surface, especially in retrofitted floors where the baseboard typically is not removed. The quarter round provides a subtle blend between the gap in the floor and the wall. Recoatable White quarter round coordinates with any laminate flooring providing a beautiful finished look to any room. Buy online Zamma Recoatable White 5/8 in. Thick x 3/4 in. Wide x 94 in. Length Laminate Quarter Round Molding 013140324, leave review and share Your friends.